A Texas jury has found Eddie Ray Routh guilty of the murder of US Navy Seal Chris Kyle, who wrote American Sniper, and his friend Chad Littlefield. The judge sentenced Routh to life in prison without parole; prosecutors had not sought the death penalty. Defence lawyers for Routh said the 27-year-old was psychotic at the time of the shootings two years ago. But prosecutors said Routh was aware of what he was doing when he gunned the pair down at a Texas gun range in 2013. The film based on Kyle's memoir of his four tours of duty in Iraq was nominated for best film at the Oscars this year. The former Navy Seal, who has the most recorded kills of any US sniper, was shot and killed along with Littlefield at a rural shooting range south-west of Fort Worth. Having retired from the military, Kyle had been helping other veterans deal with combat-related stress and mental health issues. On the day of the killings, Kyle and Littlefield took Routh with them to go shooting after the defendant's mother asked for help in dealing with her troubled son. Routh, who suffered from post-traumatic stress disorder, was under extreme mental distress and was convinced the two men would turn on him on the day of the killing, his lawyers argued. 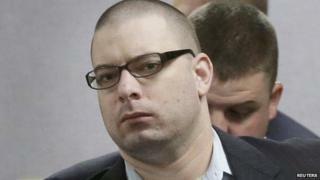 The court also heard that Routh was under the influence of marijuana and alcohol at the time of the shooting. In addition, he had been prescribed anti-psychotic medication often used for schizophrenia, reported the Associated Press news agency. Defence lawyers said Routh had been mentally affected by the time he spent helping earthquake relief efforts in Haiti with the Marines in 2010. He had pleaded not guilty to the charge of murder on grounds of insanity. However a psychologist testified for prosecutors that Routh was not legally insane, but instead had a paranoid disorder made worse by his drink and cannabis abuse, according to the Associated Press. As prosecutors had not sought the death penalty, the sentence of life imprisonment without parole was imposed automatically by the judge.